Earlier in the year I decided to make a patchwork quilt. I'm not an expert quilter - previous experience making a cushion cover when I was at school - but I decided that I wanted to create a family heirloom. Progress has been slow - it took me about a month to choose the fabric I wanted. I read up on different techniques, took advice from friends and then decided to do my own thing. I probably would have been more sensible to either start with a smaller project or to go for a squares design. 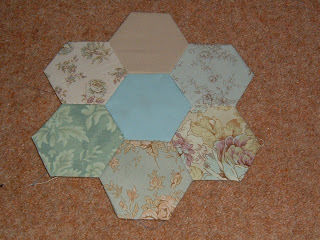 I went for a king size bedspread made from small hexagons. I've now made 8 "templates" - not sure how many more to go - but it must be lots! I'm a bit worried that it might not match in with my room decor - but frankly by the time I finish it who knows what colour my bedroom will be. I'm taking a break from it to complete another heirloom - a patchwork quilted memory cushion which is going to feature a picture of my parents on their wedding day. It's my dad's birthday soon and I thought it would be a nice present for him. I'll post a picture of it when I'm finished!